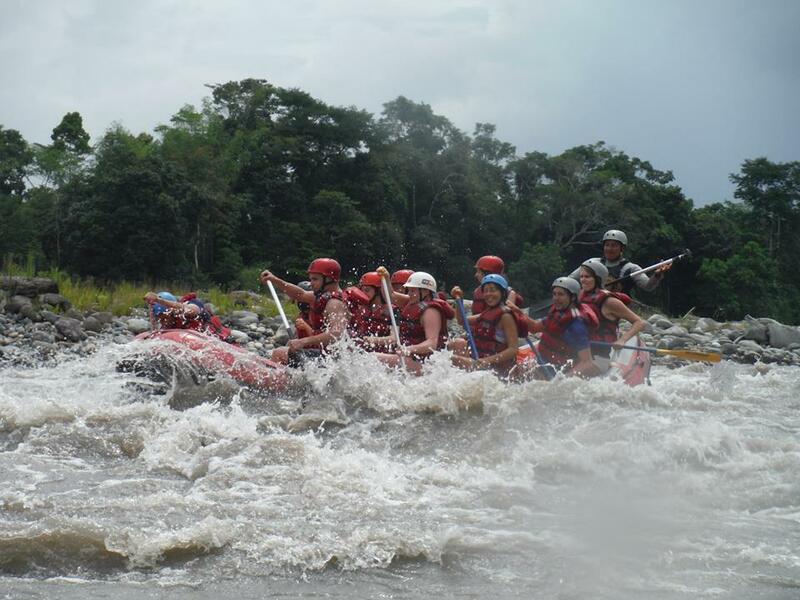 Want the a tour which combines the thrill of rafting, the beauty of waterfalls, the wonder of Amazonian plant and animal life and the pleasure of experiencing indigenous rainforest culture first hand? This tour is for you! This three-day trip brings you a fantastic mix of activities and the best that the jungle has to offer. Your first two days will be filled with unforgettable experiences of the world’s largest rainforest and you’ll spend your nights like a local – chatting round a campfire, listening to the sounds of the jungle and sleeping in traditional wooden cabins. On the last day, we raft our way back towards Tena, ending the trip with an exciting ride on the Jatunyacu River! Come and experience the jungle and the river with us! Here is a suggestion of how to spend your time with us. But it is your trip and we want you to get the most out of it – so you can choose the activities you do when you get to the cabins! The trip starts at 9am at the Raft Amazonia office at Av. 15 de Noviembre y Cesar Augusto Rueda. (We can also pick you up from your hotel/hostel if you prefer). From Tena, we travel by 4×4 and after about 45 minutes we arrive at the family’s small farm. A short walk along the path brings us to the cabins that look out onto the river. Once you’ve put your bags down, we start with our first activity. You might want to choose something active, such as the waterfall hike or you may want to learn about the plants growing all around you – cinnamon, mango, bananas, papaya and cacao all grow around the cabins as well as medicinal plants (such as ayahuasca) that the family has used for generations. After a traditional lunch, the second activity begins. Why not try some traditional indigenous jobs such as fishing, using a blowpipe or panning for gold? There‘s always time for a relaxing swing in the hammock before dinner. Dinner is often followed by a chat around the campfire and a couple of beers. Many people choose the hike to the lagoon on the second day – a stunning rock pool where you can jump in, swim or relax on a sunny rock. After lunch, a very popular choice is chocolate making. From picking the cacao pods straight from the tree, to roasting, grinding and cooking the chocolate, you’ll see how one of the world’s most favourite foods is made. And best of all, at the end you’ll have a delicious dessert of sweet, sticky chocolate – best enjoyed with some fresh papaya, picked straight from the tree. On the final day of the tour, your guide will take you to the starting point of the rafting trip where you will get your equipment and listen to a full safety talk. Your guide will make sure you feel confident about how to paddle and how to stay safe on the river. Once everyone is ready, you’ll head downstream for a 27km trip towards Tena. You’ll splash through waves of white-water, explore jungle canyons and take a dip in the refreshing waters of the river as you go. At about half way, you’ll stop at a beach for a delicious picnic lunch and some fun and games on the beach. After the last stretch of rafting, you’ll bring the boat to the banks of the river at Puerto Napo, where the truck will be waiting with your dry clothes and some cold beers! A 10-minute drive brings us back to Tena for around 3 or 4 pm and the end of your trip.